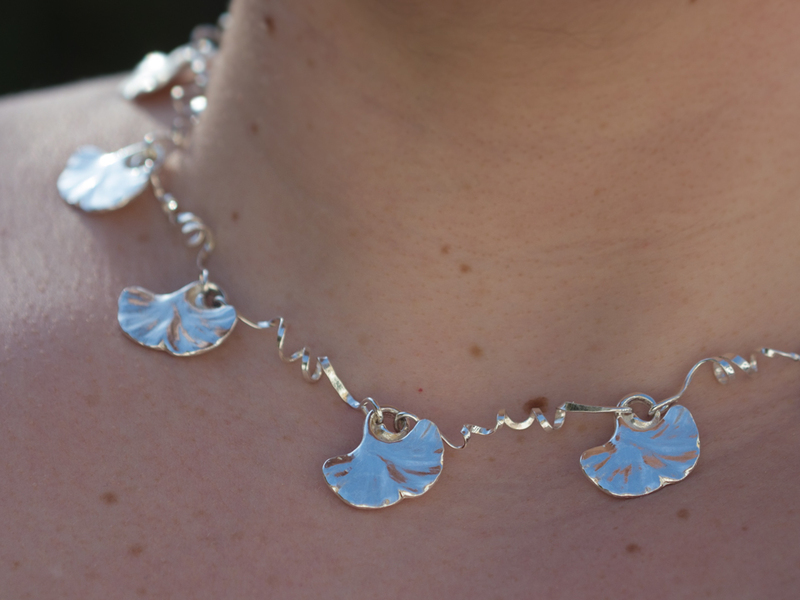 An encounter with a lovely couple on my market stall at Electromagnetic Field inspired this extravagant seven-ginkgo leaf necklace, commissioned as silver wedding anniversary gift. I really like the use of the ‘seaweed’ twists from my tideline necklaces, and it came together as a very hefty and impressive piece. 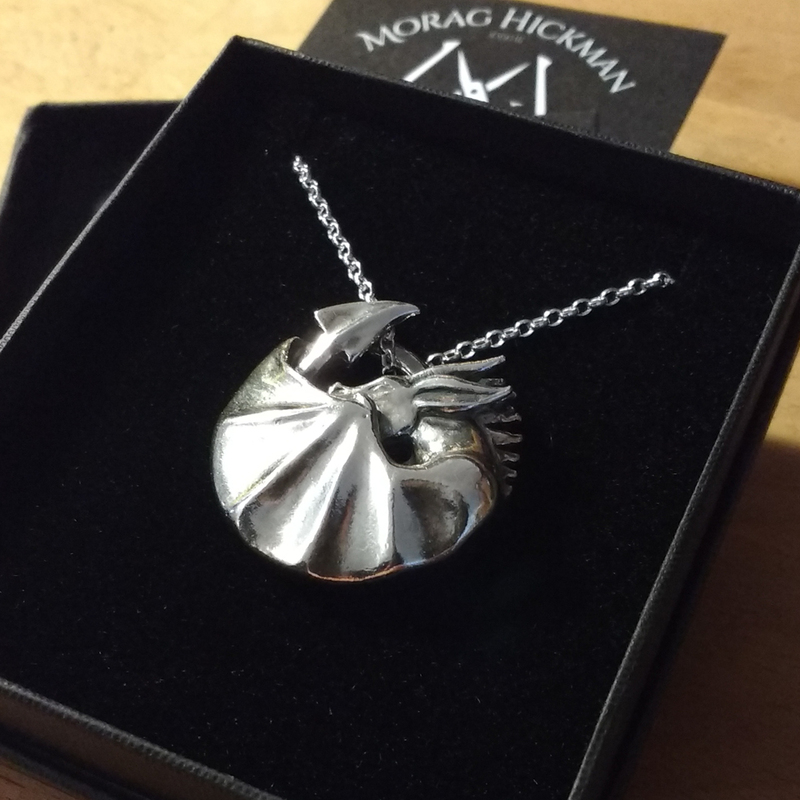 A lovely commission, to create a medallion-style pendant for a dragon lover. Cast from a wax sculpture made using my new Wolf wax carving tools. It was an absolute delight to have 18 diverse and well-made tools on hand for whatever type of cut or scrape I needed. I’m looking forward to many more sculptures using them. 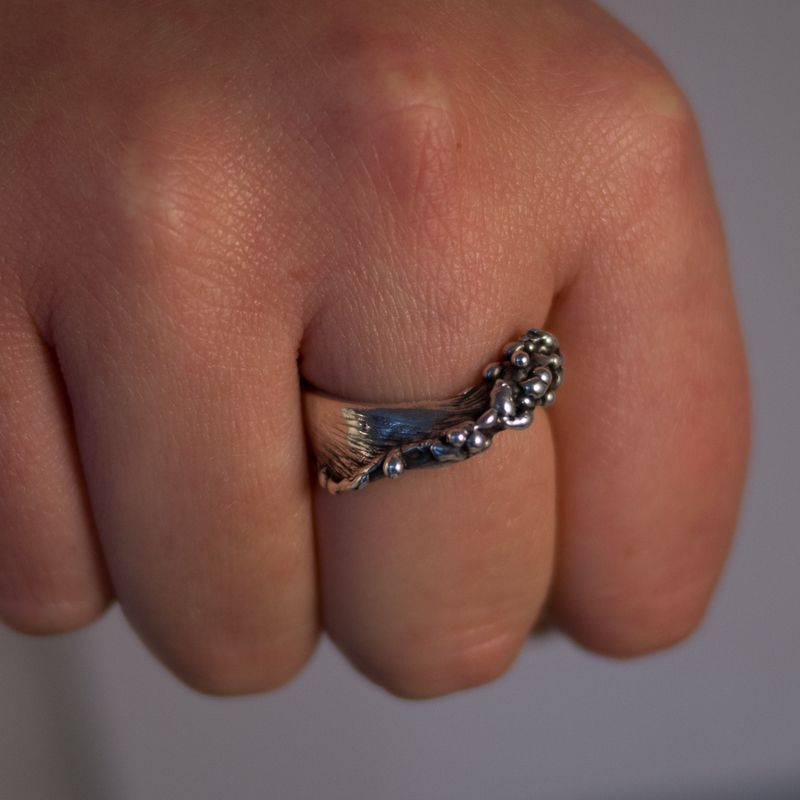 The final dragon is a little hefty at around 16g of sterling silver, even with the smooth, hollowed underside. Available from my Etsy Shop. I will also be making bronze versions – let me know via etsy or the contact form if you’d like to be notified when they’re available. 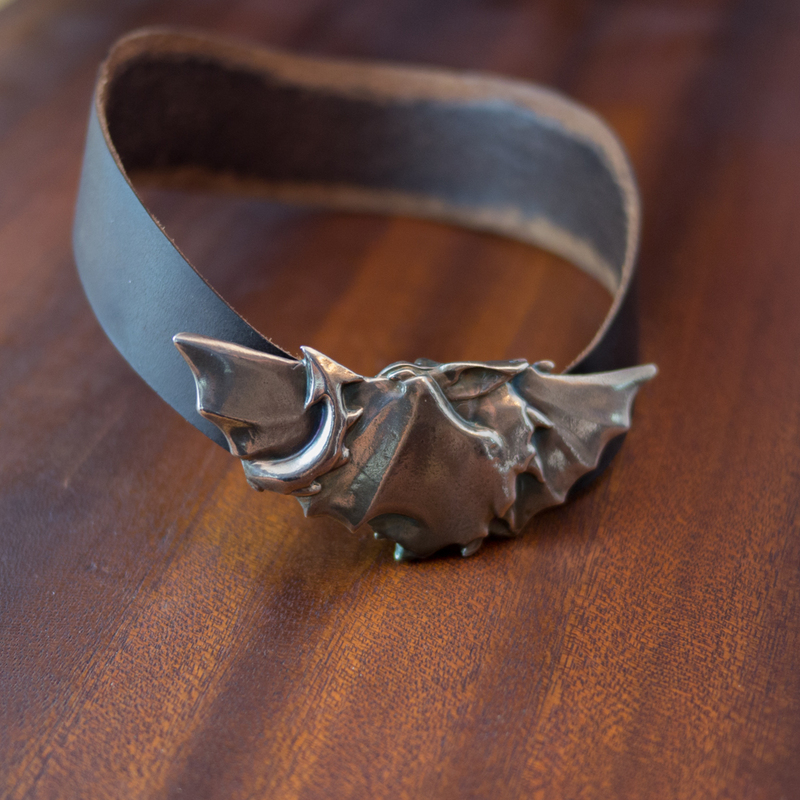 A variation on my Dragon Buckle, this time in sterling silver and mounted on a shaped, thinned leather collar. 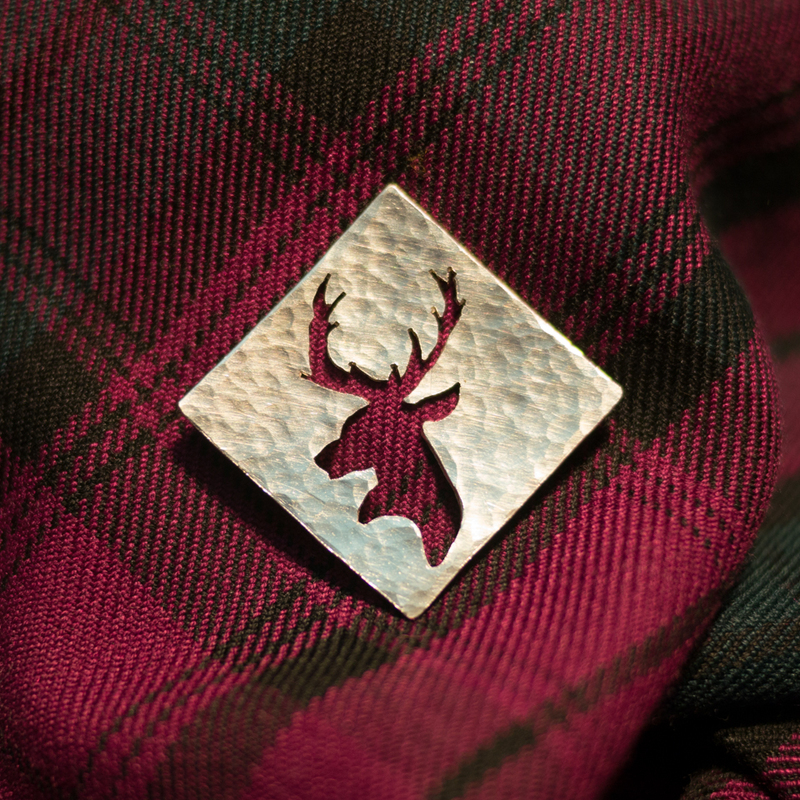 Exciting news, a selection of my jewellery will be for sale in the Bealach Café and Gallery up in the Scottish Highlands! 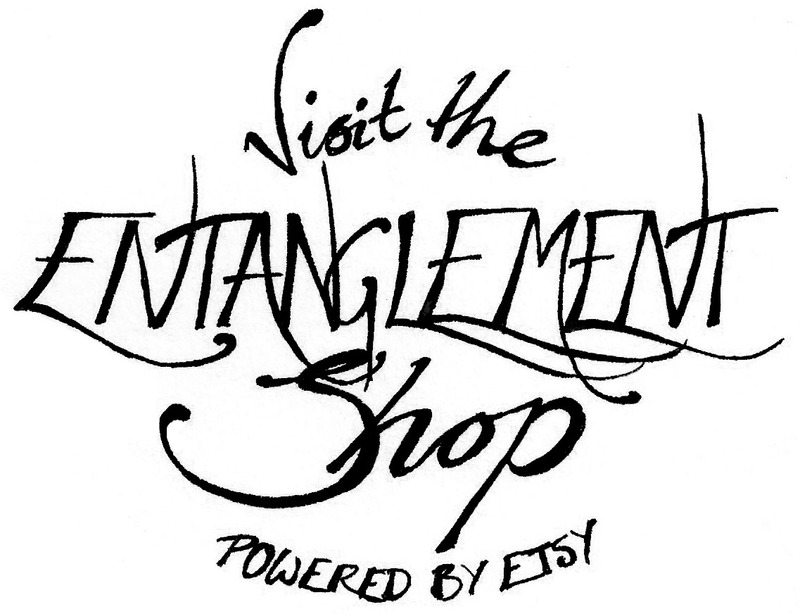 Check out their facebook page too – it’s a beautiful place, and I hear very good things about the scones! I covet so many of the gorgeous paintings on the walls, and I hope the locals and passing traffic like my jewellery as much as the setting. Pierced sterling silver brooches and pendants with hammered textures. 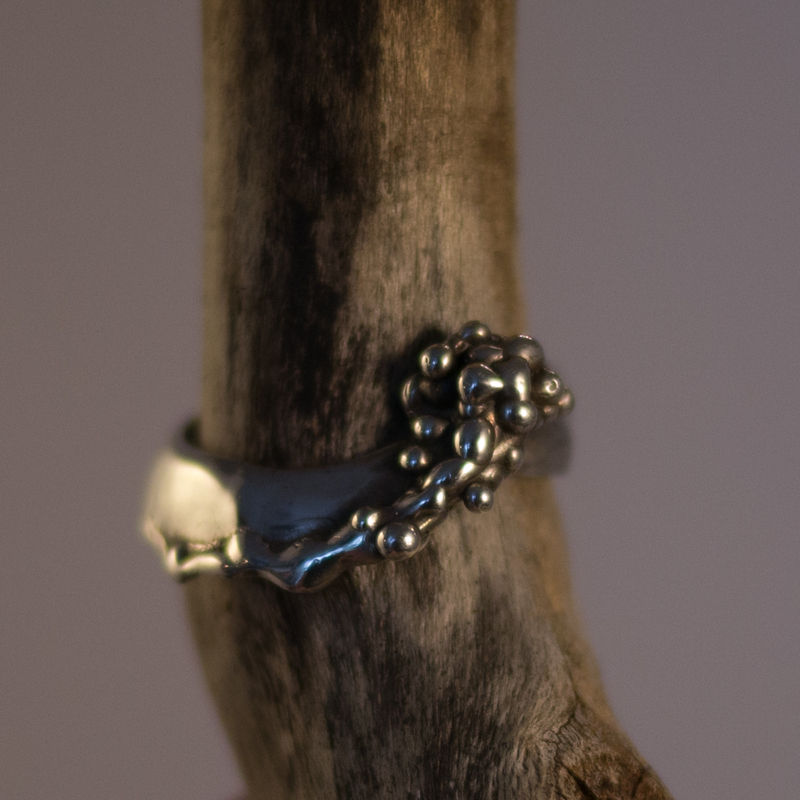 My workshop is land-locked, but with a recording of waves lapping a pebbly shore and memories of sparkling waters in my mind, I’ve created this ring so one can carry the sea with them always. Shaped to mimic surf breaking on a beach, it catches the eye but is low-profiled and comfortable for everyday wear. Shaped to mimic surf breaking on a beach, it catches the eye but is low-profiled and comfortable for everyday wear. The rest of the band echoes waves over deeper water. UK size O (approx 7 1/2 US, 55 1/4 EU), but I can enlarge it by a size or two on request. 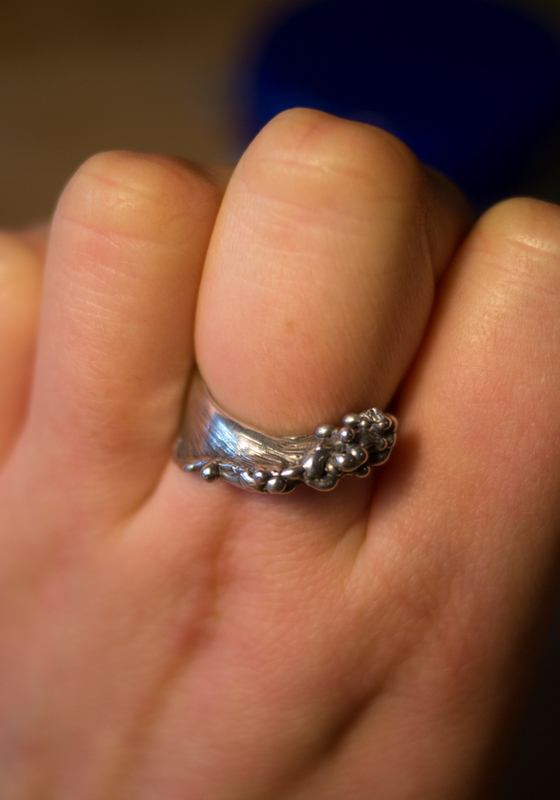 Hand-carved in wax then cast in solid sterling silver, and hand-finished. I’m eagerly awaiting the return of my latest batch of casts, and in the meantime, have been experimenting with oxidisation and polish. 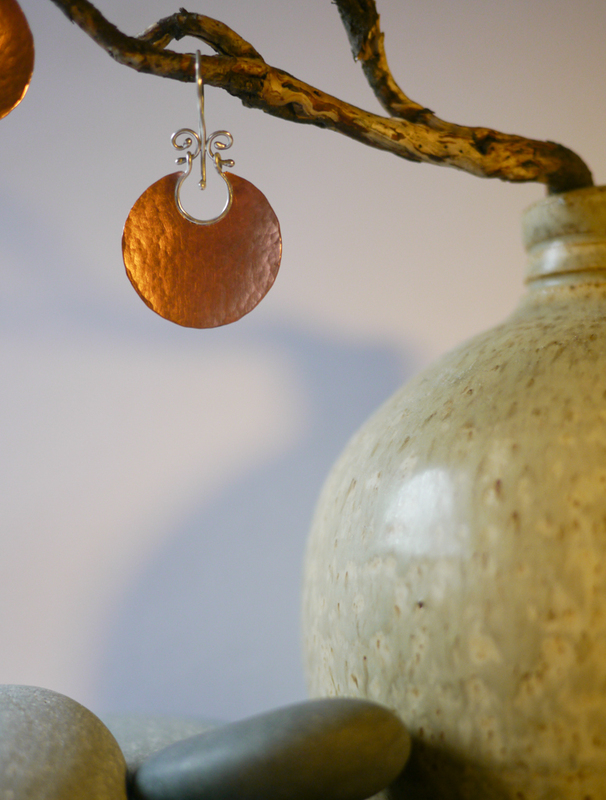 New earrings – swirly hardware and a lightly dished bright copper disc with a hammered texture. Elegant, lightweight, shimmery and eye-catching. 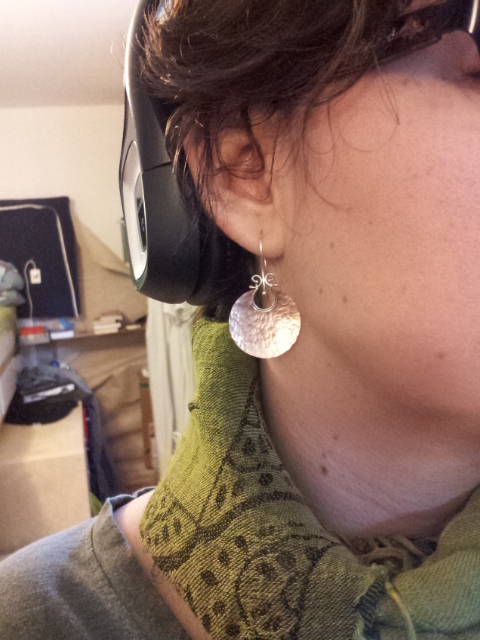 Prototyping a new pair of earrings – swirly hardware and a lightly dished bright copper disc with a hammered texture. I’m delighted with how elegant, shimmery and eye-catching these turned out. I also feel my soldering has improved a great deal – not to mention that it’s great to have a second torch when you’re working on something just a little to big for one to handle alone. Unfortunately my camera’s away for repairs, so here are some dodgy phone pictures. 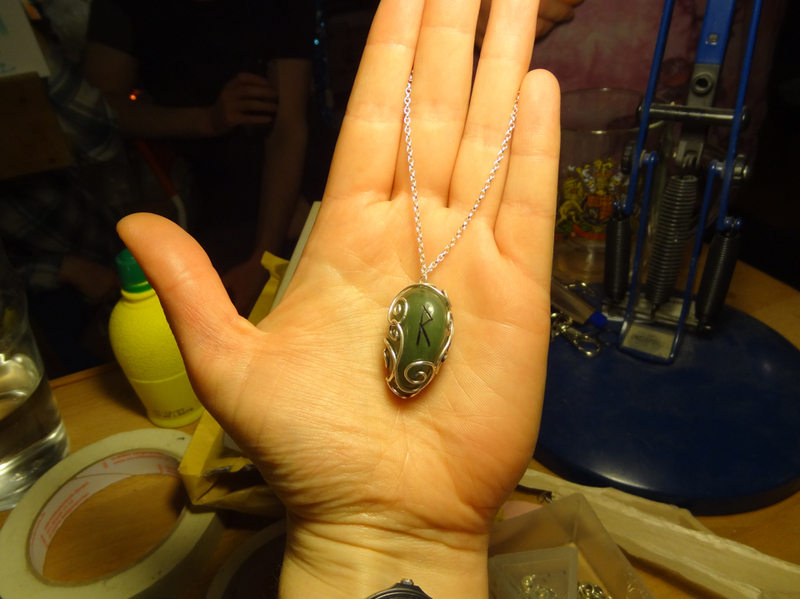 I greeted the new year with a replacement setting for a friend’s ‘journey stone’ – a ‘hug’ rather than a cage. A total of 50cm of sterling wire spirals, gradually soldered into a cage to hold the stone, and finally closed securely by interleaving two of the spirals.